Interested in owning a Body Fit Training studio? Body Fit Training is Australia’s newest and most advanced, group training methodology. We’ve incorporated scientifically proven training techniques aimed at reducing fat and creating lean muscle into a variety of 50 minute sessions that are overseen by accredited coaches in a dynamic group environment. We’ve refined and proven our unique Body Fit Training System and group training model over 18 months across multiple sites in Australia, and we’re now ready to go! We’re looking for either fitness industry “owner operators” wanting to work in the business with a hands on approach; or entrepreneurs keen to derive new sources of income by appointing studio managers on their behalf. Either way, we’re sure you’ll be impressed with the way we do things here at Body Fit Training. AN EXPLODING BRAND that your members will love! Why our offer is different, and better. 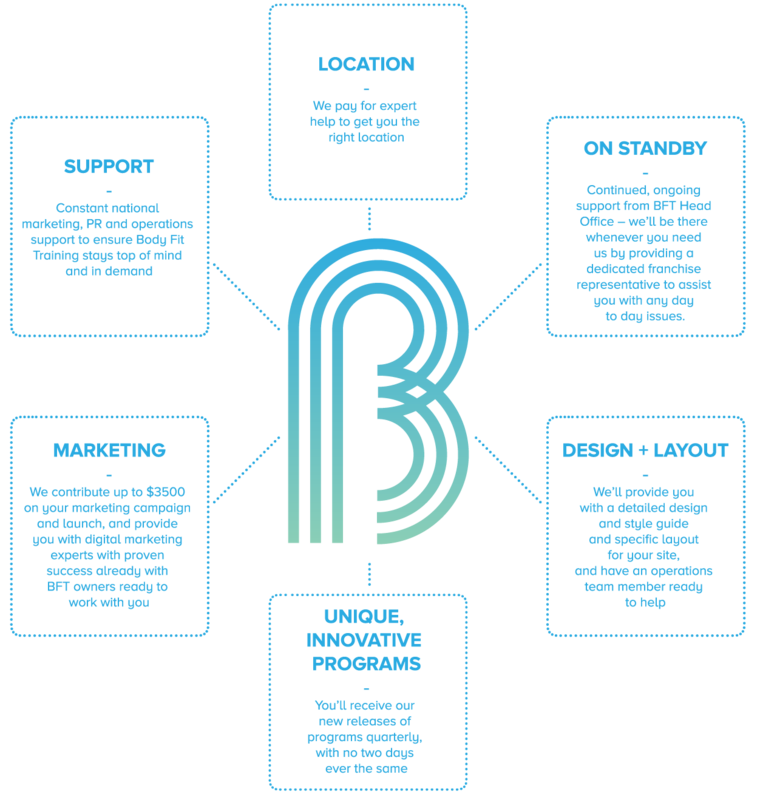 For a real estate company expert (who’s intimately aware of BFT studio needs) to help you find a studio to lease! They will help with site finding, avoiding obstacles such as car parking and noise issues, and negotiations with landlords to get you the best possible studio at the best possible price. (Dollar for dollar) on a marketing launch campaign and event to ensure you have blitzed your target market and have members ready and waiting for you to open your doors! We have a proven, robust and attractive investment returns proposition with minimum break-even and cash flow positive timeframes. Low set up costs and high margins create the right formula for success. Various financing of equipment options (for approved applicants) so you can focus on the business, and not stress about set up costs. Which suburbs/areas are you interested in? Any message or additional info about yourself you'd like to share.